Legends of the Condor Heroes 1: A Hero Reborn (2018. 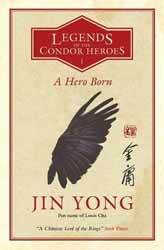 395 pages) is the first book in a twelve book series set in China in 1200 AD and the first in the Condor Heroes’ trilogy. The wuxia books were written by Jin Yong under the pen name of Louis Cha, one of the best selling authors alive. He has sold over three hundred million books and the publishers intend to release one book a year, those are George R. R. Martin scales of deferred gratification. The book was first publish in the Chinese language in 1959 and has been translated by Anna Holmwood. In China the series was phenomenally successful and was translated into lots of different media including a number of films and television stories. I have to admit that I found the novel difficult to get into. I’m guessing that the storytelling rules are different in China. For a western audience the overall lack of description is likely to be a barrier. There is little in the way of what we would consider world building. This may be due to the stories being written for a domestic audience. If Yong had been writing about London, I would only need a time period and a single point of reference to place the characters; I would say that this would hold for most cities and geography in the western world. Think Norway and I bet you thought of snow; think America and a whole host of images spring to mind. However think Wu and most western audience get nothing leaving the characters in somewhat of a limbo. As well as the world building we tend to like to have things fleshed out or explained, though probably not as far as the verbal diarrhoea which infests most fantasy books. Once more I think the book does not fare well at the cultural altar as it also sacrifices descriptions of fights with lists of Kung-fu fighting moves. It may have helped if I knew what ’Two Hands to Move a Mountain’ was and I might be better placed to imagine what is going on. Not being my area of expertise I have no idea if any of the titled moves actually exist, I suspect they would be instantly recognisable to a Chinese audience. With little in the way of description, inner dialog and a preposterous amount of fight scenes; it made it difficult to empathise with any of the characters and boy are there a lot of characters. This is a book that requires your attention if you are not to get lost in the myriad names and connections. Pretty much everyone seems to be talking in a way that you image they have an inner voice extolling them to emote and emote loudly. The actual story of a young man being raised to be a martial artist and his travails with both growing up in the Mongol empire and his rivalry with a prince is pretty good, if you can get over the stylistic issues. I suppose the best way of thinking about it is asking would I recommend Julius Caesar's Conquest of Gaul. It is certainly an interesting and important book, but Caesar's weird way of talking about himself in the third person makes the book odd to read. This is also the case with A Hero Reborn which comes from a different literary tradition. You will either love it, especially any martial arts fans out there, or hate it, but it’s got to be worth a look, three million books sold cannot be all wrong.